← How did Calvin Coolidge Save $500 by Lighting the First National Christmas Tree? 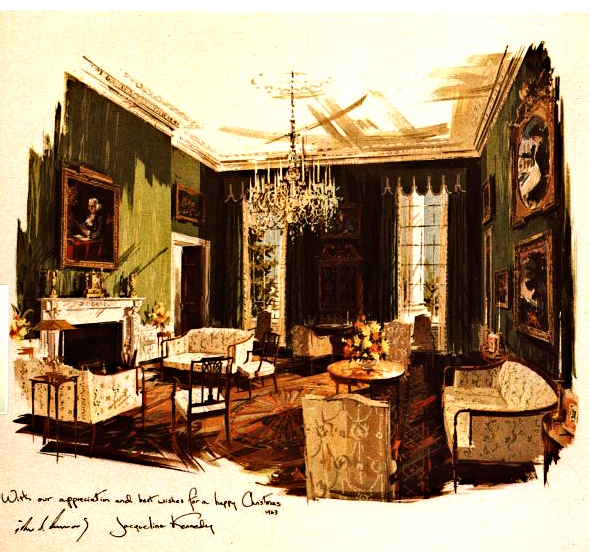 On the morning of November 22, 1963, the art director for Hallmark Cards in Kansas City mailed 200 prints of a water color of the White House Green Room to Jackie Kennedy at the White House. The boxes arrived at a Washington D.C. airport less than 30 minutes before President John F. Kennedy died from an assassin’s bullet in Dallas. The painting of the Green Room had special meaning because it showed the Green Room after its renovation. Passionate about preserving history and art, Jackie had led an effort to restore the historical character of the White House by acquiring furniture and art. In this way, she turned the White House into a museum and established the White House Historical Association. Artist Edward Lehman had painted water colors of the restored Red Room, Green Room, and Blue Room. Prints of Lehman’s Red Room painting had served as the Kennedy’s Christmas gift to the White House staff in 1962. Ever the visionary, Jackie had invited Lehman to spend Christmas in 1963 at their Virginia home so he could paint a water color of Kennedys in front of their personal Christmas tree. Also before the assassination, she had written a Christmas message for Look magazine. Jackie had observed that while the White House is often the center of national attention, it simultaneously serves as the home of an American family anticipating the joy of the Christmas season. “But through Christmas, we keep unbroken contact with the simple message of the redemption and love that God sent into the world so many years ago,” Jackie Kennedy. Source: Seeley, Mary Evans. Season’s Greetings from the White House, p. 86-99. Jane Hampton Cook is the author of eight books, including American Phoenix, http://www.americanphoenixbook.com. This entry was posted in History, Politics and tagged Jackie Kennedy, John Kennedy, White House, White House Historical Association. Bookmark the permalink.